To Preserve Quinces, White or Red? Through a current collaboration with Thomas Ward (United States Naval Academy), I have found something of interest in early modern quince preserves. 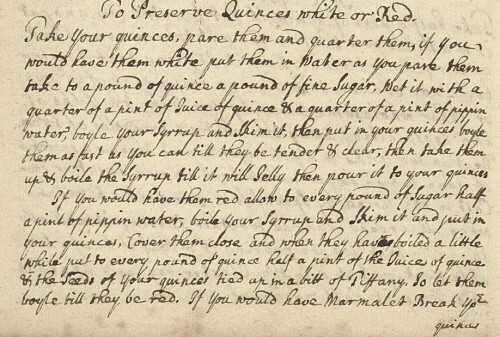 [i] Across the Wellcome Library Digitised Collection, examples of recipes “To preserve quinces” evenly divide between two (or three types), “To preserve quinces red” and “To preserve quinces white” (the third category being some mixture or in-between of the two). [ii] Regularly, a white quince recipe will be on the same page as a red one, which presents an immediate choice to the preserver. In close reading, I have come to realize that this choice is about something more than color. Setting a red recipe next to a white one, we can begin to suss out the issues, but three late seventeenth/early eighteenth century recipes provide both the red and white options within one entry and thus make the differences most apparent. Generally, red quinces are boiled at a “leisurely” pace (one recipe, MS 3341/009, records a four hour process,), covered, and with lower grade of sweetener (not necessarily refined sugar, even using fruit juices instead, which also added a gelling component). White quinces are often boiled rapidly in the syrup made with double refined sugar, sometimes cooked before being added to the syrup, and, at some point determined by fruit tenderness, color change, and/or syrup thickness, the quinces are removed from the syrup to cool while the syrup continues to thicken, and then they are added again later in the process. Much of the time making red quinces is uninterrupted, allowing for “multi-tasking,” either in or out of the kitchen. Not necessarily so in preserving white quinces. Not only are you often told to boil the quinces “as fast as you can uncouered” (see MSs 7818/52, 7999/10, 3341/10), which would present the danger of boiling over and burning, the added step of taking them up before they turn red requires extreme care. One recipe even calls for “shifting” the quinces into “water ready to boil,” not once or twice, but “into seuerall such waters till they be tender (MS 2330/5). Clearly white quinces are more difficult to make as they require extra care and a larger proportion of time spent watching the pots. Because much of this care is about anticipating the moment of color change, the implication is that the more a person makes the white quince recipe, the more aware she or he would be of signs of the oncoming change. That is, the more experienced preserver would be more prepared and his or her quinces would thus be whiter. It follows, then, that the choice between red and white quinces has meaning beyond a color preference or even taste. Whether or not white quinces taste better than red ones is almost beside the point. If you present white quinces at the table, you signified an occasion deserving of the more “high maintenance” preserve, whereas red quinces, made at a more leisurely pace and with cheaper ingredients, are likely to be your “everyday” variety. At least the experienced cooks among your guests would appreciate the difference. [i] I have also noted this variation with pippen preserves. Charms can be found in all manner of medieval manuscripts, scrawled in the margins or added (seemingly at random) on blank pages and in the flyleaves. Usually they were simply stuck in some place convenient by someone who thought they would be useful or interesting to have on hand. However, charms also appear in medieval recipe collections, mixed in with recipes for nosebleeds or toothaches or different coloured inks. In these contexts, where does one separate the charm from the recipe? Should they even be separated? Let’s back up a minute and think about exactly what I mean by a charm in fifteenth-century England. In medieval Europe, the forms of charms and recipes are generally the same. Both are formulas, whether spoken, written, or chanted. Both have an oral and a written component. And both used words and phrases from the Bible, liturgy, and other religious texts familiar to the average medieval person. For example, the Flum Jordan charm to staunch blood is based on the Biblical story of Jesus’s baptism in the river Jordan. Just as the river stopped flowing when Jesus entered the water, so the blood will stop flowing once the charm is recited. Additionally, prayers could take on apotropaic properties – the recitation of Paternosters and Ave Marias for protection or healing was encouraged in orthodox worship and these two prayers frequently appear in charm texts. For the ordinary lay person there could be much confusion concerning what was a charm (and therefore bad) and what was a prayer (and therefore good). The cause of this confusion can be explained by looking at the proliferation of sacramentals, which were an important part of popular belief in late medieval Christianity. Sacramentals were objects: things like candles, salt, and water, that had been blessed by the parish priest and distributed to all the households. The candles were lit during thunderstorms to drive away the demons thought to be active during storms, while the water was sprinkled on the hearth to drive away evil or sprinkled in the fields to promote fertility. Water and salt could be given to sick animals. It’s easy to see how this Church-sanctioned practice could lead to similar practices with objects that had not been blessed, but which were thought to have special God-given properties. It was difficult for the average person to distinguish between the two types of objects, since both could be used and manipulated. Users of charms and folk magic were not concerned with the finer points of theology but with the fact that both sacramental and charms had a power that presumably came from God. There was a very fine line indeed between magic and orthodox religion. Magic in the fifteenth century was firmly established within a Christian framework and fit into people’s belief systems in a natural, rational manner. Countries and regions might favour one type or one motif over another, though. Wind, for example, was more common in Russia, with charms of ill-purpose said to be “sent on the wind”. Romanian charms, at least in modern times, involve the use of both gestures and formulas. The evil eye, while fairly common in countries like Hungary, is unknown in the medieval English corpus of surviving charms. The one commonality across medieval cultures and countries is the dominance of healing charms, which survive far more than any other charm type. Unsurprisingly, medical charms are often found in collections of medical recipes. Health and wellbeing was a serious concern in the Middle Ages and, if a cure was questionably orthodox, well, that was alright as long as it worked. 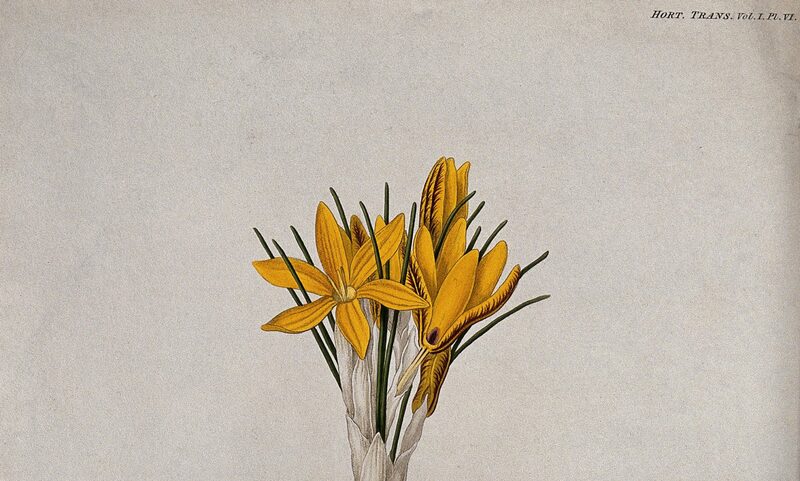 In these collections, we find charms for bleeding, toothaches, fevers, blurred vision, insomnia, wounds, childbirth, worms in the ear, and falling sickness (epilepsy)–but not for such things as back pain or swollen feet. Scholars don’t really know why medical charms are restricted to a small number of ailments, but some scholars like Lea Olsan believe it’s because there are no Biblical stories nor religious imagery that can be associated with other ailments. Charms appear in all diverse medical recipe collections, from the household collection of the Haldenby family in Cambridge (Trinity College MS O.1.57) to the collection of the physician Thomas Fayreford (British Library, Harley MS 2558). This suggests that they were regarded with little or no distinction from the non-magical recipes with which they are grouped. Charms and recipes are presented as equally valid and proper texts to read and/or use, but what distinguished them was merely the source of their curative powers. Medical recipes broadly relied on natural means and associations, whereas charms derived their power from the divine, the supernatural. But even that distinction can be too simplistic! For now, I hope it is clear that the distinction between magic and medicine was more blurred than we often think. Most medieval people considered charms to be no more harmful or unorthodox than any other recipe they might encounter in their daily lives. Lea Olsan, “Charms in Medieval Memory,” in Charms and Charming in Europe, ed. Jonathan Roper (Great Britain: Palgrave Macmillan, 2004), 60. On the rationality of medieval magic see Richard Kieckhefer, “The Specific Rationality of Medieval Magic” American Historical Review 99:3 (1994): 813-836. W.F. Ryan, “Eclecticism in the Russian Charm Tradition,” in Charms and Charming in Europe, 117. 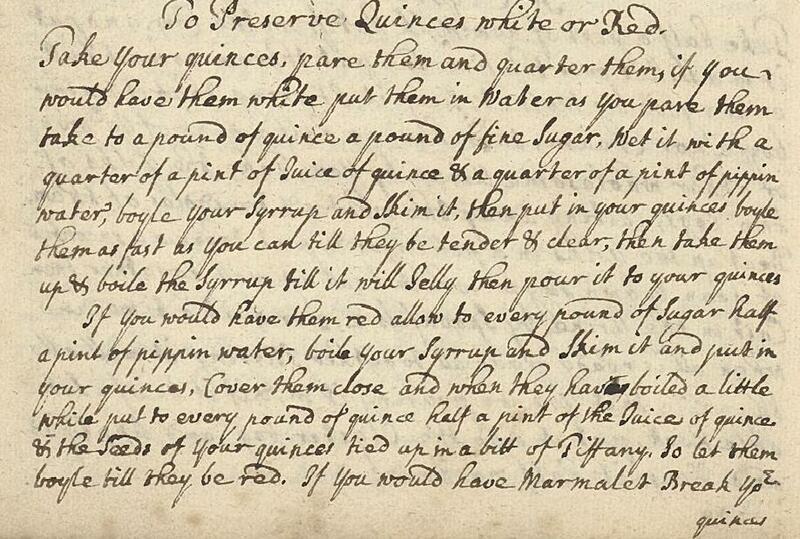 As anyone familiar with early modern recipe collections well knows, recipe compilers liked to cross things out. One compiler, Lady Anne Fanshawe, particularly springs to mind. Her notebook is filled with pages of recipes which she has crossed out with a large ‘X’. Take a look at the following page from her notebook. Wellcome Library, Western Manuscript MS 71113, p. 10. 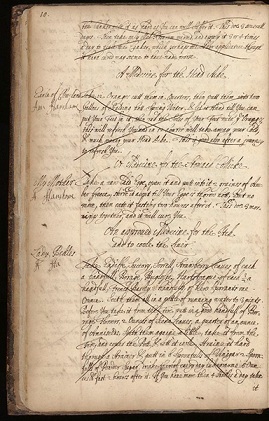 Wellcome Library, Western MS 3712, Recipe Book associated with Elizabeth Okeover, fol. 6v. Interestingly, while Anne gives us few hints of why she so brutally crossed out all those recipes in her book, Elizabeth was kind enough to let us know why she crosses out recipes. At the bottom of a crossed-out recipe on page 4, Elizabeth writes ‘Right ritt and an approved & good Salve but crost by mistake’. So, for Elizabeth, the crossing-out of recipes was reserved for information, which was erroneously transcribed, and/or know-how which did not meet her approval. These were not the only reasons that led Elizabeth to scribble out information, she also crossed out duplicate recipes as she explains in this little tidbit on a loose bit of paper: ‘Some Reseits in this Book by mistakes was writ twice over; So one of each is crost But this harder yellow Salve Should not have bine Crost’. With no rubber/erasers, Tipp-Ex/whiteout or delete buttons to hand, crossing-out, for early modern recipe users, was a way of information management. For many of you, my mention of Tipp-Ex may bring back school-day memories and that other helpful tool the ink eradicator. I, for one, have not used either deletion/correction tool for at least a decade which brings me to the point of how we as 21st century recipe collectors/users now manage our stores of household information. My mother-in-law, an avid home-cook, manages her cookbooks with a system of external indices (lists of selected recipes awaiting trial), post-its and meticulous annotations. Flipping through her archive of Gourmet or Bon Appetit, one finds little penciled notes in her neat cursive hand next to tried and tested recipes. A diligent and conscientious note-taker, she records not only the date and occasion the dish was served but also whether it garnered the approval of her dinner guests. Disappointing dishes are marked as such or with more descriptive criticisms such as ‘too bland’ or ‘too sweet’. In none of her 30-year run of the main American cooking magazines or her shelves full of cookbooks can one find a completely crossed-out recipe. As a modern reader, trained by public libraries on the evils of book defacement, she simply couldn’t bring herself to reject recipes with the same flourish as Anne Fanshawe and Elizabeth Okeover did hundreds of years ago. How we read and use recipe books is not only intrinsically tied to how we value books as material objects but also to how we were trained to read. My mother-in-law, if she will forgive me for disclosing this, came of age in the 50s when printed cookbooks, magazines and newspapers served as the main way of circulating recipes publicly. For our generation, dare I say it, paper is slowly giving way to digital media. We now search for, learn about and discuss recipes on blogs, social networking sites and twitter. There is no longer a need to cross-out unwanted information or to wait for the Tipp-Ex to dry, we merely have to press the delete button. It is all so simple for us but if Anne Fanshawe and Elizabeth Okeover left historians a trail of crossings-out to reconstruct their narratives, what are we leaving future historians? The blog will consider recipes through the ages, ranging from medieval alchemical recipes to twentieth-century jellied salads. 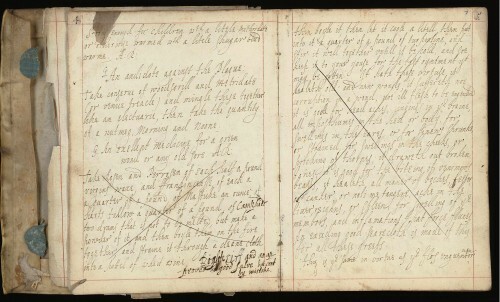 The blog is connected to a larger crowd-sourcing project (hosted at the University of Saskatchewan, but with collaborators from Germany, the U.K., and the U.S.) to transcribe recipe books, beginning with some of the seventeenth-century ones that have been digitized at the Wellcome Library, London. The project’s crowd-sourcing website and software are still in development, but we hope to make them public in the autumn 2012. We plan for the website to be a portal to several recipe-related projects. We are working towards, ultimately, extracting data from the transcriptions to trace recipes and ingredients over time and place.